Nucleus radar system. This new range of radars has a simple tracker ball, with three push buttons, re- placing the conventional keyboard. The comprehensive use of multiple colors based on IMO/IHO 1990 rec- ommendations provides an easy to view display of radar picture, select- able functions, warnings, target in- formation, and own-ship navigation data. Nucleus 5000 R Relative Motion. The Nucleus 6000 range has a 660 mm display providing a 340 mm radar picture, while the 5000 range has a 500 mm display and 250 mm radar picture. To be a leader all over the world seas. It's the strategic choice of a Company constantly seeking high quality and advanced technologic solutions. Mariotti is a leader in international ship's repairing. Mariotti: an image of creativity, efficiency, perfect organization. Since 1928 an efficient and flexible organization, the ability of Technicians, worker's teams highly skilled, have entailed Mariotti to be appreciated all over the world. Repairs and conversions of all kind of ships. General overhaulings of main auxiliary engines, mechanical equipment. Dry dock works, installation of machinery and equipment. Marine has supplied galleys to over 800 ships around the world, ranging from tugs to the most modern cruise ships. Metos Marine, which special- izes in on-board catering, operates as an independent unit of the Inter- national Instrumentarium Corpo- ration. The company's business, which had a turnover of $430 million in 1990, revolves around creating func- tional on-board catering systems, ranging from individual pieces of galley equipment up to a restaurant business concept. Caravelle; and the SWATH cruise ship SSC Radisson Diamond, which will enter service later this year. Microbe Treat L. It will keep sanita- tion systems in optimum operational conditions and assist in maintain- ing drains, traps and lines clean and clog-free. Sensitive to pollution related is- sues, Vecom focused its research towards a product likely to stay har- monious with environmental re- quirements well into the future. In addition, Microbe Treat L has been prepared specifically for maritime operating conditions and poses no hazard for the ship's crew. In detail it's a uniquely-formu- lated liquid blend of naturally-oc- curring, non-genetically engineered living aerobic and anaerobic bacte- ria that are specially selected and adapted for their ability to produce enzymes that will degrade sanita- tion waste. All the bacteria used are sub- jected to stringent antibiotic screen- ing to ensure that they are safe to use. 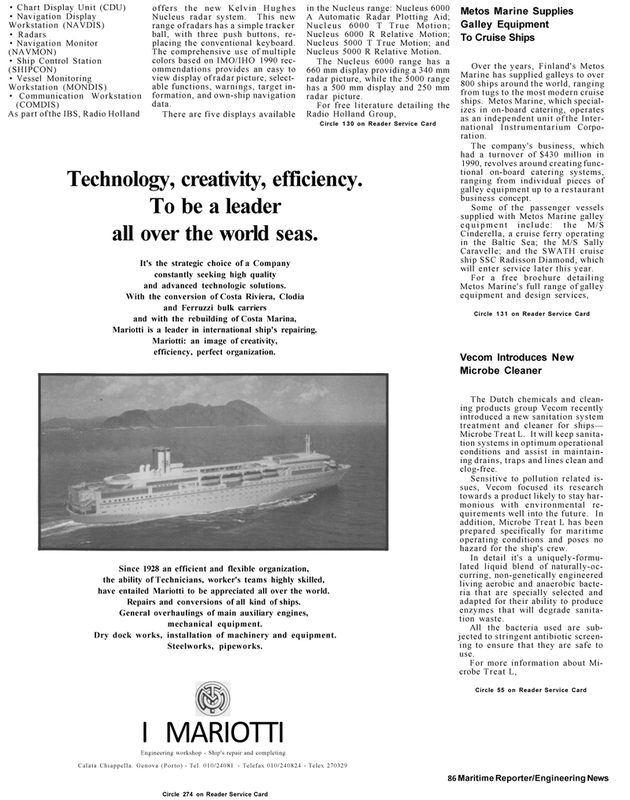 First published in 1881 Maritime Reporter is the world's largest audited circulation publication serving the global maritime industry. New Wave Media are publishers of the maritime, offshore and subsea industries leading print magazines, including: Maritime Reporter & Engineering News; Marine Technology Reporter; MarineNews and Maritime Professional.